Poorly produced virtual reality PSAs are as ineffective as any other bad after-school special. You've probably considered the importance of avoiding drinking and driving, but I'm guessing you've never experienced the consequences of it in VR. Johnnie Walker teamed up with Samsung to create Decisions, a virtual reality video that lets you see, first-hand and in 360 degrees, what happens when you drink and drive. 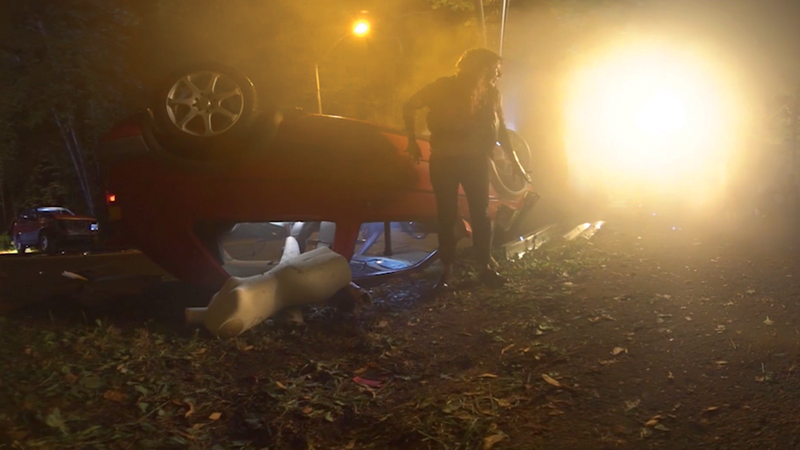 The idea is to make the consequences so real that you'll be deterred from driving while intoxicated. I tried out the full experience this week (complete with a vibrating "4D" chair), and left feeling less chastened than I thought I would. I received a link to the 360-degree YouTube video prior to taking the full-fledged demo, and was underwhelmed by what I initially saw. I was hoping for a first-person experience that put me in the driver's seat, one that would somehow make me feel like I was responsible for the consequences of my decisions. But there is no decision-making for you in this video (which is fair, it's not a game) and therefore you aren't really responsible for what happens later. Instead, you're an onlooker watching the bad choices made by someone else, which somewhat defeats the purpose of using virtual reality as a medium. I could watch a movie the old-fashioned way and get the same results. Decisions follows a woman who has just received a call while on the road telling her she's been offered a job she wanted. The film features two other cars: one carrying a couple on a date, and the other a trio of friends, respectively. The main character stops for some celebratory drinks and chugs down a bunch of pints in an effort to bond with her soon-to-be colleagues. The video cuts among the three vehicles about eight times throughout its four-and-a-half-minute runtime, which I found distracting. 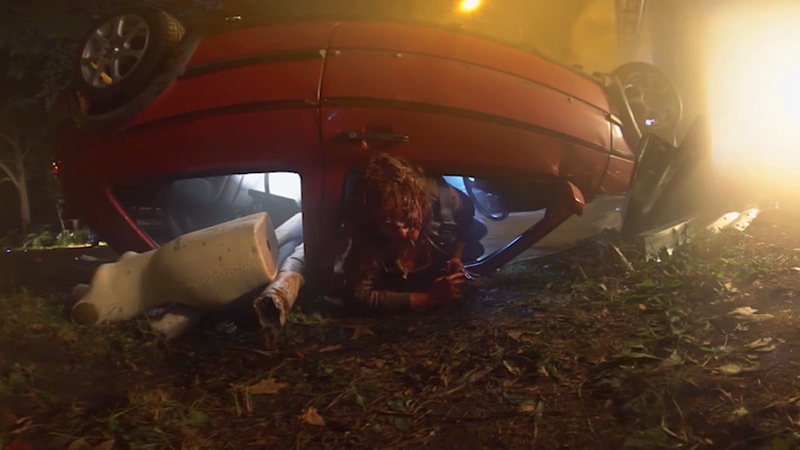 Cutting back and forth among the three cars is to encourage the viewer to connect with the characters, which is a bit morbid because you know from the onset that something horrible is going to happen to them. It's also a little unrealistic, because drivers in the real world don't know the strangers in the cars next to them. But Decision's creators want you to empathize with the drivers here so that you can mourn them when they eventually die. Insisting on this relationship between the viewer and characters feels forced, though, especially because the story is finished in all of four minutes. The heavy-handedness of the video gets especially extreme at the end of the clip. As you look on at the victims of the crash, you start floating in the air, as if you were the spirit of someone who had just died. I know it's supposed to be poignant, this moment where you're thinking about the people who were just killed. But it was ultimately distracting and cheesy. My experience was slightly different at a recent event hosted by Samsung and Diageo, Johnnie Walker's parent company. There, I was given the latest Gear VR headset and a set of headphones, then strapped into a chair that vibrates, moves and swings around in sync with the video. It simulated the feeling of being in a car, from the gentle rocking of a smooth drive on a highway to bumping and swerving during an accident. This was definitely a more immersive experience, and to be honest, sort of fun. I was apparently the only person who started giggling just as the simulation's car collided with the surrounding vehicles. I felt sheepish, but couldn't help enjoying what felt like a tame roller-coaster ride, despite the awful accident unfolding before my eyes. That's probably not the reaction the company was hoping for. Diageo will be taking this experience (with the chair) to shows such as South by Southwest to let more people try it out. Meanwhile, those with their own headsets at home can find the video on YouTube or Facebook. The company says it will be taking user feedback into account to come up with new and better content in future. The question is whether future iterations can ever be effective. My main problem with this version is that it doesn't make the viewer decide what to do, thus absolving them of any responsibility. But even if an edition put you in the hot seat, offering options such as "Don't pound that extra pint" or "Wait till you're sober," it still might not be very instructive. Picking the right option is easy, especially when the answers are so obvious. No one experiencing this demo is going to choose to drink too much or drive while intoxicated -- not unless they're curious to see what happens. If Diageo is going to fine-tune this experience, it would do well to look at more successful efforts to generate empathy through VR. The game The Circle puts you in the body of a wheelchair-bound transgender woman who's suffering from PTSD. It places objects out of the frame, showing how difficult simple tasks like picking up a phone from the floor can be when you can't use your legs. The game lets you decide whether you want to engage with family members, or ignore them. Finally, The Circle induces motion sickness -- a common side effect of VR -- to help you further empathize with the protagonist, who feels uncomfortable in her own body. To its credit, Decisions does use some tactics that were effective in making me feel as if I were inebriated. During the lead-up to the accident, the surrounding landscape grew blurry, I felt slightly nauseated with motion sickness, and the point of view finally shifted to show me what I had wanted to focus on all along: the road in front of me. But before I had time to understand that the blurriness was a result of being "drunk," I was thrown sideways as the car slid out of control. That's something Diageo can improve on: timing. A longer experience that's more immersive and told from the viewer's perspective would be a better use of the medium. I also would have needed to be in an enclosed space to truly feel the terror of being in an out-of-control car. Instead, I was in a mostly open area, acutely aware that at least five people were watching my reaction. Even if Diageo implements those tweaks, though, it still runs the risk of talking down to the viewer. One reason The Circle is so compelling is that it introduces the player to someone he probably doesn't know in real life: a transgender woman trapped in a wheelchair. But everyone knows, theoretically, that you shouldn't get behind the wheel when you're intoxicated. You can send the same message by making people sit through a civics class full of videos of horrifying car crashes, although a better-executed, more realistic VR experience might be more compelling. Consider AT&T's VR experience for its "It Can Wait" campaign to combat distracted driving. That video puts you behind the wheel, and you watch as the character whose body you're occupying repeatedly reaches for her phone to reply to texts. During your drive to work, you narrowly miss killing several pedestrians and nearly collide with other vehicles not once, but a few times. It's only when a car crashes into you at the end of the clip that you're forced to understand how dangerous distracted driving is. I never saw it coming, because I had been conditioned by the first few close calls to believe that I would not get into a fatal accident. That's a big difference between AT&T and Diageo's efforts: Only one felt surprising. While Diageo's video had better production value and a more dramatic storyline, AT&T's experience was far more realistic. It also uses the first-person perspective, which I found more effective. Even though both clips have equally noble intentions, it was the subtlety in the "It Can Wait" video that made it scarier -- and therefore more effective. As a first attempt, Decisions is underwhelming, but Diageo's willingness to accept feedback is encouraging. But future iterations need to be more subtle and engaging to influence viewers and let them feel like they could, under the wrong circumstances, make the same bad choices. Together with the chair and an enclosed space, Diageo's VR setup could eventually create an experience harrowing enough to leave a more lasting impact.